You will love our chalet, which we remodelled to provide ideal accommodation for families with children or groups of friends. The location is superb, just a couple of hundred yards down from the Morel chairlift, which will whisk you straight on to the pistes. At the end of the day you can ski right back to the Morel lift. In Summer you have beautiful walks from the front door, a stunning golf course nearby, and of course our wonderful sunny terrace, and balconies. You should find all you need at the chalet - free wifi, books, games, satellite tv (main channels only), a DVD player, an i-pod docking station, deckchairs, boot warmers, plentiful hot water. Next door is the famous Chez Kiki restaurant, and its welcoming bar. Just up the hill is a small supermarket and ski rental shop, together with a number of other restaurants. 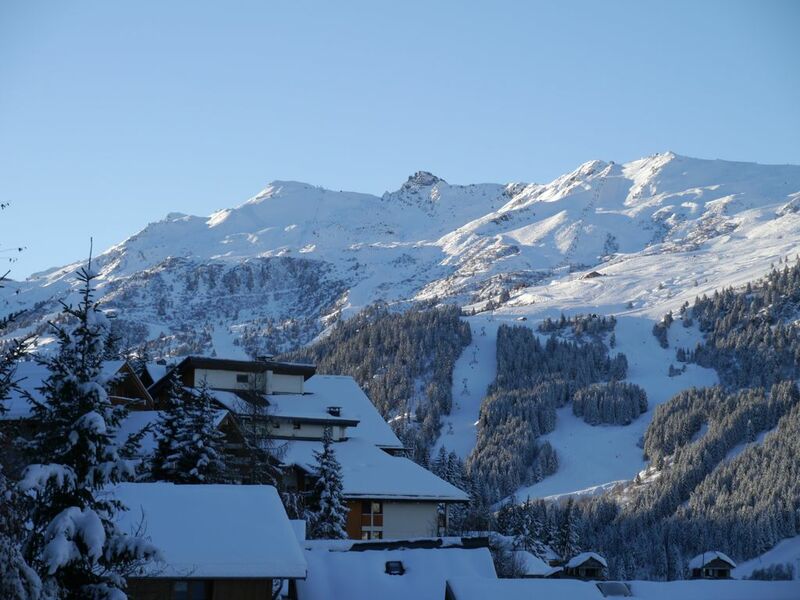 My husband and I have skied in Meribel since 1987, and we have always loved the beauty of these mountains, the pretty architecture and of course the extraordinary range of the ski area. Our children learned to ski here, and two of them went on to become keen alpine ski racers. We all love being here in our warm, comfortable home, and we hope you will enjoy it too! Open plan living/dining/kitchen area. Built in seats and a refectory style table seating 10+ in the dining area by picture windows. To the rear of the open space, comfy seating on large corner sofa and armchairs. Flat screen TV, ipod dock, CD player. Long table with chairs and benches around. This is a very sociable eating area. The chalet is 3 mins from the Morel chairlift linking you in to the vast ski areas of the Trois Vallees. There are over 200 lifts and over 600km of marked pistes. This is largest ski area in the world and renowned for safety and piste maintenance. At the end of the day, either ski down the run back to the lift, or catch a ski bus back to the same place. The world class 18 hole Meribel golf course is just over the ridge from the village, but to drive to the club house, about 3km away, takes less than 10 mins. Course open from May to end October. Please ask for more information. Notes on accommodation: TV has basic satellite package. There is a phone for local/emergency calls. There is a boot warmer in the garage. The sitting room has a lovely glass enclosed fireplace with logs provided. Outside: To the front is a large sunny balcony with lovely views leading from picture windows in the dining area of the first floor. On the 2nd floor the two front bedrooms share a further small balcony with the same aspect. The other 2nd floor bedroom has a small side balcony. Utility Room: Washing Machine, tumble dryer, drying rack, iron, ironing board. Cleaning / Towels / Linen / Maid service: Tariff includes full cleaning before and after your stay (subject to normal terms and conditions). In winter, linen, bed making and towels are included. Other: Games area on ground floor, with table football (adjoins ground floor bedroom). Cosy reading spot with comfy armchair on 2nd floor. Large garage for bikes, deckchairs (provided), walking boots, golf clubs. I’d highly recommend staying at Le Petit Bercy while skiing in the 3 valleys. The chalet is excellently located close to the Morel chairlift, meaning less time wasted on ski buses! There are also great views across the valley from the balcony adjoining the living area. However, if visiting during the winter, be mindful that there may not be parking as the area outside the chalet was under metres of snow. There are parking spaces available around 100m further uphill and a larger free car park further up. The chalet itself has a large kitchen table which comfortably accommodated our group of 10 for evening meals. The kitchen is well stocked with all of the appliances you might need and the fireplace was a real bonus after a day on the slopes. The host, Jennifer, was also very helpful and responded quickly to any questions we had regarding the property. Overall, a great option if looking for a self-catered option with quick access to the slopes. Thank you for such a nice, and helpful, review. I am so glad you enjoyed your stay, and hope you will return in future. This season the quantity of snow was indeed exceptional, and that did mean the drive became inaccessible. I have changed the description of the parking arrangements to reflect this risk in the future. Myself and 9 friends stayed in Chalet Petit Bercy for a week in March 2018. The Chalet was very charming, with 2 decent sized double beds, and 3 rooms with single beds which was perfect for a large group. It was easy to find, using Chez Kiki restaurant as reference on the sat nav as the actual address didn't come up in the sat nav. Parking was a little more of an issue due to the large amount of snow covering the driveway as we couldn't park up on the drive, so we had to find a parking spot nearby which wasn't too much of an issue, which would always have been the case for larger groups with more than 1 car. The Chalet was well stocked with cutlery and crockery, as well as ample glasses and mugs. The table easily sat 10 people with room to spare, and the living area was very cosy with the wood fire and comfy sofas. The Chalet is around 100m from the Morel lift which made getting to the slopes very easy, and is a simple green then blue run down into Meribel centre, or you can easily get to the Corchevel valley if you head the other way. In the evening, you have the option to ski back to the bottom of the Morel lift and walk back to the chalet, or there is a little off piste run that leads you back to the chalet, but this is rather narrow and can be icy. The other option is the free bus that stops at the morel lift which you can get from the town centre or from the Rond Point (if you are having a little apres ski!). There is a little promenade of shops around 200m up the hill from the Chalet, with a small supermarket (actually fairly reasonably priced for a alpine shop to buy essentials), a bar and a ski rental shop. Jennifer was very helpful and responsive before and during our stay when we had a few queries about the Chalet. Overall we very much enjoyed our stay at Petit Bercy, and would certainly look to return on our next visit to Les 3 Valleys! Thank you for your review, Sam, and I am so glad you enjoyed your stay. We hope to welcome you back to the chalet in the future! We had a great time in Meribel staying at Chalet Petit Bercy. There was nine adults in our party and we found the chalet very spacious with a good ratio of bathrooms to bedrooms. On arrival chalet was very clean and warm and had all the amenities that we required. Great location near Morel lift and possible to ski back to chalet. Good local bar, restaurants, supermarket and only a ten minute walk to centre of town. Would highly recommend this chalet. There is a French language school in Meribel Town. Private Guides can be booked for snow shoe walking in winter and hikes in the woods with a Botanist to view the wild life and fauna in the summer. There is a fitness area and spa, together with an indoor swimming pool, climbing wall and ice rink in the centre of Meribel. In the Summer season (July and August) there are tennis courts for hire, a wide range of children's activities, riding and of course wonderful mountain walking and mountain biking. The golf course is exceptional - full 18 holes, with stunning views and surroundings. Bozel lake, surrounded by mountains, has a lovely beach with life guards, a sectioned off area for learners / kiddies, café, toilets and showers. 10 mins car ride. Lake Annecy, renowned as France's prettiest, is a 50 mins drive for swimming and sailing. Chambery with Flybe & Jet2 from Southampton, Exeter, Norwich, Birmingham, Manchester, Leeds/Bradford, Newcastle. New Globespan from Edinburgh. Transfer: 55 mins. Easyjet, BA, BMI & Ryanmair to Lyon &/or Grenoble Transfer: 1hr 45 mins.Plus Geneva, 2 hrs 15 mins. Calais 9 hours drive (751 miles). Eurostar, TGV & Snow Train to Moutiers, 15 mins away. Public transport (bus and train) and private & shared transfers available. Car hire from all airports. Meribel centre 10 mins walk downhill (but there is a bus service back again if you prefer!). Brides Les Bains, spa town, by car 15 mins or via Gondola from Meribel 20 mins. In the region are the interesting towns of Grenoble (an hour's drive), Annecy (also about an hour away), and of course Moutiers in the valley about 20 mins drive. Next door to the chalet is the renowned "Chez Kiki" restaurant and bar. A few minutes walk away are a Sherpa supermarket, ski rental shop, and several restaurants. Meribel centre has a full range of shops, restaurants and bars, including chemist, bank, medical centre, tourist office, excellent butcher, boulangerie/patisserie, stationers/tabac etc.